If you kept on knitting would this turn into an afghan???? Size 7 (US) needles, worsted weight cotton. then knitting some spa cloths to tuck in along with soap, a candle, rubber ducky, etc. It’s a lot of fun, nice light knitting for these hot and hazy days of summer. 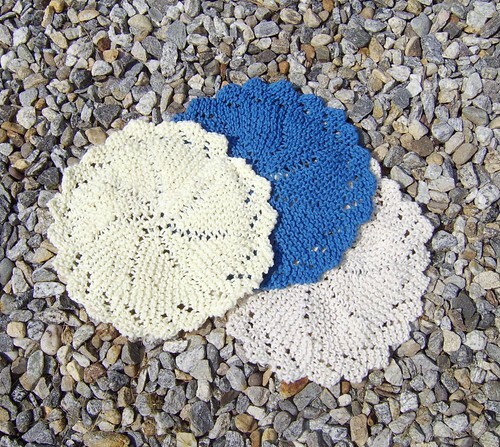 I found this pretty pattern, simply called “knitted round dishcloth”, over at the Mielke’s Farm website. They feature several other free patterns as well.